This article provides a overview of the Microsoft Office Server Products with Logical Architecture diagram. The Microsoft Office SharePoint Office SharePoint Server (MOSS) builds on top of Windows SharePoint Service 3.0 (WSS) MOSS offers two edition Standard and Enterprise. The Standard edition provides functionality on top of this collaboration platform with aggregation, search, and content management features. The MOSS enterprise edition provide additional features such as Web forms, the business intelligence (BI) and Business Data Catalogue (BDC). Microsoft Office Forms Server 2007 provides scalable, security-enhanced, standards-based data-gathering solution for your organization. 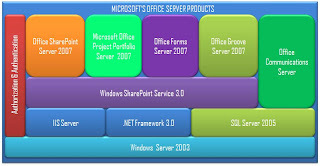 Microsoft Office Forms Server 2007 is a server product built on Microsoft Windows SharePoint Services 3.0. It enables users to create / fill out Microsoft Office InfoPath 2007 forms by using Office InfoPath 2007 client program. Microsoft Office Forms Server 2007 also builds with new capability to fill forms via Web browser instead of Microsoft Office InfoPath, Office Forms Server 2007 also provides a central location to store and manage form templates for your organization. Microsoft Office Forms Server 2007 is tightly couple with MOSS Enterprise servers edition which render Web-based forms. From a licensing perspective, Forms Server is recommended if you just need Web-based forms capability, and MOSS Enterprise is recommended if you need Web forms along with the other SharePoint features. Microsoft Office Project Portfolio Server 2007 is a top-down portfolio management solution that helps organizations to best align with their business strategy. Office Project Portfolio Server 2007, a key component of the Microsoft Enterprise Project Management (EPM) Solution, can help executives gain visibility, insight, and control across their project, program, and application portfolios. Office Project Portfolio Server 2007, Which is tightly integrated with Office Project Server 2007 can help ensure that customers and partners can quickly deploy world-class portfolio analytical techniques and tools within the Microsoft EPM Solution. Groove 2007 is a very powerful application that enables teams to collaborate easily across organizational boundaries whether connected or offline. Groove 2007 help to encrypts information on local computer as well as transition and also faster way to share larger documents via shared peer to peer. Groove enable you to work with data offline and sync when detects a network connection. Groove tools include a discussion board, a Groove Files Tool, task list, and The SharePoint Files Tool, a feature in Groove 2007, enables users to take a SharePoint document library offline. Groove and the SharePoint Files tool provide a convenient and efficient way to collaborate with people who are outside the corporate firewall. Office Communications Server 2007 added with following additional functionality and key features of the application. Web conferencing, Video conferencing, Instant messaging, Presence information, Public IM connectivity, IM federation, Data Collaboration, Contact management and Outlook integration. Office Communications Server 2007 (OCS 2007) is available in two editions, Standard Edition and Enterprise Edition. OCS 2007 Standard Edition—Allows you to deploy in a single server using an MSDE database. It supports up to 15,000 concurrent users. OCS 2007 Enterprise Edition—Allows you to deploy in pools of servers connected to a common SQL database to be utilized, allowing up to 120,000 users. Windows SharePoint Services 3.0 (WSS) product is a free product it can be downloaded from Microsoft and installed on any Windows Server 2003 system without any additional licensing. (You need to buy the Windows 2003 server licensing). 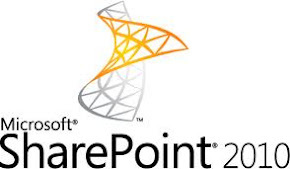 WSS contains a subset of the capabilities provided in the full Microsoft Office SharePoint Server 2007 product. WSS provides a secure, scalable, enterprise-level portal environment for collaboration, and is comprised of a set of components and services that serve as an add-in to Windows Server 2003. WSS provides following key features Document collaboration—check-in/out and versions, Wikis and blogs, RSS support, Project task management and search capabilities.